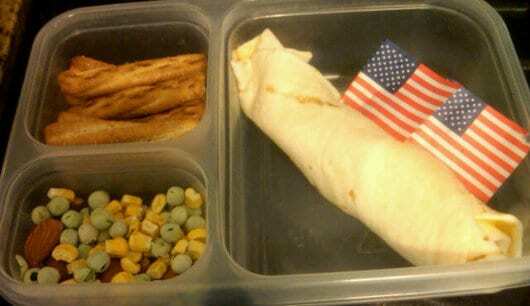 I make fun lunches for my son so he stops saying he hates school. I don’t think he ever really disliked school, but it was our morning routine to run around the house like crazy people, whining about not wanting to go to school, and be unable to find clothes (in the closet), shoes (in the basket), toothbrush (by the sink), cereal (in the kitchen) and other items (that never move but are just impossible to find while whining). One day I made a fun lunch, and suddenly clothes were on, teeth were brushed, breakfast was eaten and Joe was ready to take his lunch box to school. Simply amazing. Now, sometimes my lunches are more creative than others. My first lunch this week was a desperate attempt at cool. 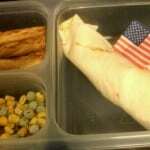 I made a cheese quesadilla roll up, and pinned it close with a flag toothpick. I added some pretzels and freeze dried peas and corn. Joe did not seem to notice that quesadilla roll up is a made up meal. He ate it all and did not complain about school at all. 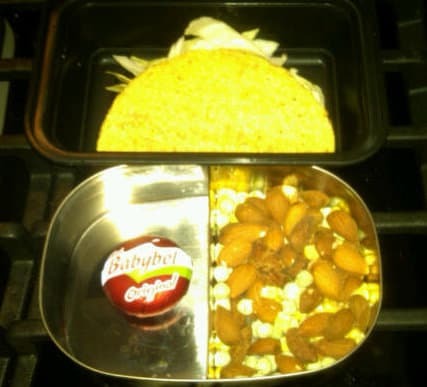 The next lunch was a taco shell filled with beans and cabbage. I added a Babybel cheese, nuts, corn and peas. Joe liked it all but told me I gave him too many nuts. Looking at the picture here, I have to agree. But if that’s the only complaint, I’m still going to declare myself the lunch box Queen. Another Halo Heaven Coupon Code - Cheap Tutus, Bows, Pediskirts and More!